You guys, I’m back! It’s almost the end of 2018 and I am in shock. Who else is with me when I say that 2018 whizzed past the fastest that any year has?! Christmas came upon me so quickly that I wasn’t even ready for it at all. This past year came with a lot of changes–both good and bad: I survived yet another breakup, my blog took off, I boosted my Instagram following, I met all kinds of amazing blogger babes here in the STL, I turned 30, and I got a new job! Whew! With NYE coming up in less than a week, I wanted to share three looks that I put together that will make you the life of the partaaay! One is particularly amazing since the entire look is under $40! I snagged this green lace babydoll dress from Altar’d State and it was on sale! I also HAD to get these Steve Madden maroon velvet booties from DSW on sale for $40! The pearl necklace I found at an antique store. I’ve linked several similar dresses on LiketoKnowIt here and here. 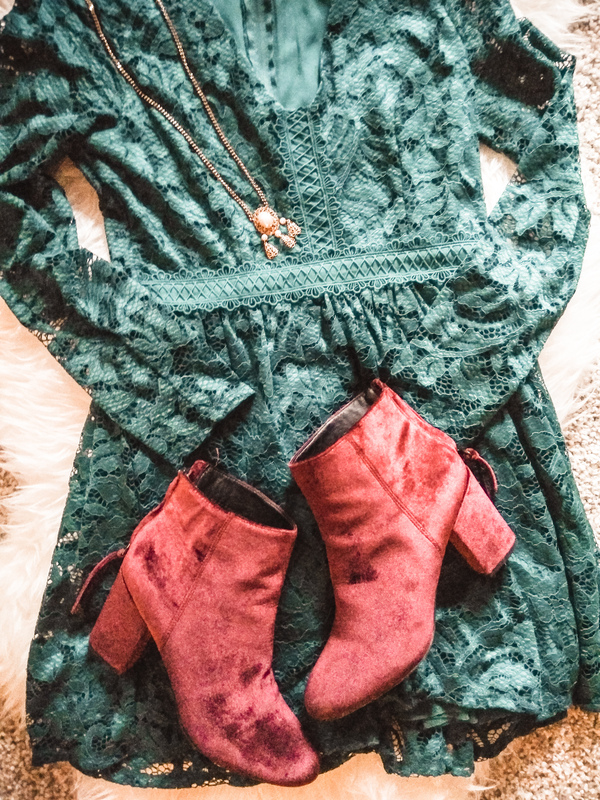 Shop the velvet booties here. Shop a similar necklace here. This look is both casual yet also glam! If you’re a jeans lover, this look is for you! I found this Who What Wear top at The Resale Shop for $6, these jeans at Target, and these sparkly booties at Payless on clearance for less than $20! These gold triangle earrings were found at a thrift store for a few bucks! Snag these sparkly booties here. I am so excited to share this final look with you all because I put this together for under $40 (dress + booties). This is the look I’ll be wearing for NYE and am so pumped. I happened upon this Adrianna Papell cocktail dress at The Resale Shop for $15!! Yep, that’s right, and it’s like new! These booties are the same ones in the previous look and I cannot wait to pair them with this dress! A Kendra Scott charm bracelet pairs well with this look as well as SoLayne Designs earrings made locally in STL!